Ha! I don’t need a Blagger’s Guide to Tolkien – I can go and see the films! And what about when your date asks you about the books afterwards? What then huh? Huh?? Legend has it that the central idea for The Hobbit came about when Tolkien was marking a set of student essays. John Ronald Reuel Tolkien was born on 3 January 1892 in Bloemfontein, South Africa, the oldest of two sons of bank manager Alfred Tolkien and his wife Mabel. Tolkien moved back to the UK at the age of three. By the time he was 12, both his parents were dead. He was raised by a guardian and developed his early proficiency for languages into a career, becoming an expert in Anglo Saxon and Middle English and eventually securing a professorship at Pembroke College, Oxford. What was an Oxford Don doing writing fairy stories? Tolkien wasn’t alone in combining an academic career with writing fantasy; CS Lewis, creator of Narnia, was an Oxford contemporary. The two men were good friends, as well as both being devout Christians (Lewis’ conversion is attributed by some to Tolkien’s influence). They, along with several other academics, formed a literary group known as the Inklings, which met weekly in Lewis’ college rooms and a local pub called The Eagle and Child. The Inklings was an early form of fantasy writer’s forum, with writers reading out their work to each other for comment. The Hobbit was one of the first works given the Inklings treatment. Not really. Legend has it that the central idea for The Hobbit came about when Tolkien was marking a set of student essays. One of the papers contained a blank page, on which Tolkien impulsively wrote the single sentence ‘In a hole in the ground lived a Hobbit’. Tolkien then expanded on those nine words to create a home, a village and eventually a world for his Hobbit to inhabit, at first only as a story for his children (Tolkien is occasionally portrayed as a crusty old bachelor, but he married in his twenties and had four children). He did read it to his fellow Inklings, but didn't think seriously about publication until he lent the manuscript to an ex-student and friend who in turn showed it to her friend Susan Dagnall, who worked for Allen and Unwin. It was only after the company showed interest in The Hobbit that Tolkien finished and edited the draft. The Hobbit was published in 1938 and became a solid seller within a few weeks of its appearance. Not at first. For decades The Hobbit was classed as a children’s book and did steady if unspectacular business. Then came the 1960s, the birth of the counterculture and the beginnings of the environmental and back-to-nature movements. For reasons hard to fully explain (but which are probably causally linked to the discovery of psychedelic drugs) The Hobbit and its sequel, The Lord of the Rings, became hugely popular with adults at this time. The Tolkien-fandom that subsequently developed became so intense that it eventually drove the professor and his wife out of Oxford to retirement in Bournemouth. This is why the Blagger’s Guide is so important. Imagine your embarrassment if you had said that in front of your date. You’d be going home alone, wouldn’t you? Tolkien originally planned LOTR as one volume, but it was eventually split into three by the publishers, to keep the price down. The films tell the Middle-earth story in reverse order. The Hobbit explains how Bilbo Baggins came to be in possession of the Ring (he wins it from Gollum in a game). Tolkien then struggled for about twenty years to carry the story forward. His first attempt was The Silmarillion – which some claim was begun before The Hobbit – a series of legends about Middle-earth in the time before Bag End and the Shire. Tolkien’s publisher either didn’t like the idea of a prequel, or, more likely, didn’t think many children would enjoy the book. To this day, The Silmarillion is for the hardened enthusiasts only, as Tolkien really let rip on the detail, creating, in effect, his version of the Bible for Middle-earth. If you like reading prose verses about the exact lineage of every elf in Valinor, then The Silmarillion is for you. Back to the drawing board. Tolkien decided that his next attempt might involve a proper plot and picked up the story a few decades after The Hobbit left off, with Bilbo now passing responsibility for guardianship of the Ring to his nephew Frodo, who then undertakes a journey to destroy the Ring and defeat the Dark Lord Sauron, who once again attempts to dominate Middle-earth. Tolkien originally planned LOTR as one volume, but it was eventually split into three by the publishers, to keep the price down, and delivered to an expectant public between 1954 and 1955. Again, as with The Hobbit, sales were good but not stellar until its transformation into the must-have text for the drop out generation. But you said Tolkien was a devout Christian. How did the church take his work as the acid-head’s fiction of choice? Sadly, history does not record this. Tolkien was raised a Catholic and took his religion extremely seriously: he gave up his courtship of his eventual wife because she was a protestant, later resuming the relationship with the agreement of his guardian once he reached the age of 21. He called his work ‘fundamentally religious and Catholic’ and the books do contain much Christian symbolism such as elves, dwarves, dragons, rings and huge lidless eyes. In fact Tolkien’s whole Universe bears a much stronger resemblance to the Norse mythology on which he was an expert than it does to either the Old or New Testament. The Germanic legends - on which Wagner also based his Ring cycle - are stuffed full of the same dwarves, giants, vengeful birds and talking trees as Tolkien's Middle-earth. It could be that Hitler's fondness for that same heroic mythology (Tolkien wrote most of LOTR during WWII) explains why the writer later shied away from drawing the obvious parallels between those legends and his work. Did he write anything else? 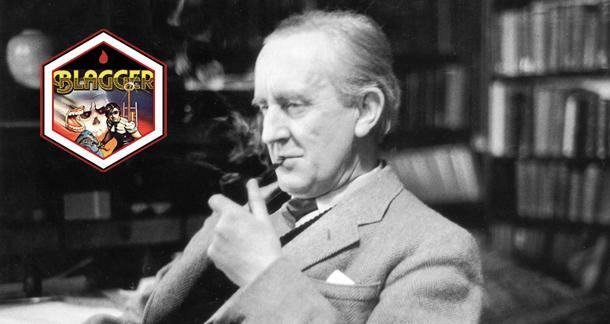 As an academic Tolkien produced many essays and articles on various aspects of Old and Middle English folklore. He wrote some children’s stories, a collection of poems about Tom Bombadil, who appears briefly in LOTR, and left a huge collection of unfinished work based on his Middle-earth Universe. Some of this was published posthumously, by his son Christopher, notably The Silmarillion, A History of Middle-earth (which runs to several volumes) and most recently a narrative poem called The Children of Hurin. None of these come close to capturing the magic of the first two books, but keep hardened fans happy and – because Tolkien’s posthumous work was edited by his son – the tribute websites raging with debate over how to pronounce Ainulindalë without hurting yourself. OK try this: Tolkien was probably the first modern author to be pirated on a large scale. The wait for the paperback version of LOTR stretched out so long (mainly because Tolkien insisted on answering all his fan mail personally instead of spending time on revisions) that a US company called Ace Books decided to satisfy demand by bringing out its own, completely illegal version. Instead of resorting to expensive lawyers, Tolkien then pulled a stunt which demonstrates you don’t need social media for a grass roots campaign. He included a note in every fan letter explaining what Ace Books was up to. News spread, the fans imposed a boycott and the publisher came under so much pressure it wrote to Tolkien offering him a royalty on each copy of LOTR it sold. In other words, Tolkien ran a Twitter campaign 40 years before Twitter existed. If recounting that little snippet doesn’t impress your date, nothing will. Tolkien enlisted as an officer in the First World War. He later wrote that he based the character of Sam Gamgee on some of the privates (working class soldiers) who served with him in the trenches. Tolkien had a long and complicated friendship with fellow author CS Lewis. Towards the end of their lives they became estranged, yet when Lewis died Tolkien remarked, ‘this feels like an axe-blow near the roots’. Tolkien was resolutely old fashioned. He resented newfangled inventions and when the Government was funding the first supersonic passenger plane wrote ‘not for Concorde’ firmly across his income tax payment. Also, he wrote an F You letter to a German publishing company when they wanted to publish The Hobbit in German (surprise surprise) and they asked for proof of his Germanic ancestry. His letter was of course much more eloquent than F You.